My grandfather quoted endlessly from Alice in Wonderland. I grew up loving the Alice books and the many movie versions. I even got to play the Duchess once in a Children's Theatre production, which was wicked good fun! Doilies have always held a place near and dear to my heart, in fact the first Valentine I gave my husband was handcrafted with a paper doily. This idea popped into my brain a couple of weeks ago and from there I scouted out supplies and through a process of trial and error figured out how to make this choker. Which I adore. I am wearing it to the upcoming tradeshows. It would be perfect for a Valentine's party, don't you think? It is made of paper, so of course one should not wear it in the shower, the swimming pool, the ocean or in a rainstorm. It's not meant to last forever, so it will need to be handled with care. You could make this with lace, but I wanted that classic paper doily look. 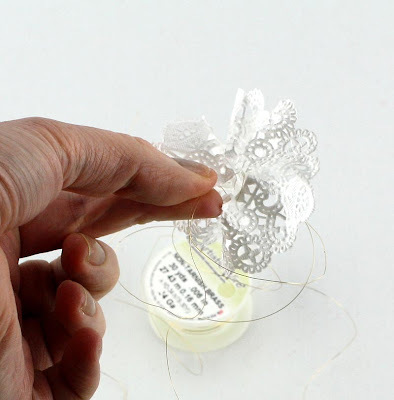 These little doily flowers are fun too, I think you could use them for all sorts of clever crafts. Nothing says vintage Valentine quite like a paper doily! It was so easy to put this all together with Aleene's Fabric Fusion Peel and Stick Sheets! 1. Cut out the center of the doilies. Use 34 gauge wire threaded into every fourth or fifth hole in frame around open center to gather the doily together into a "flower." 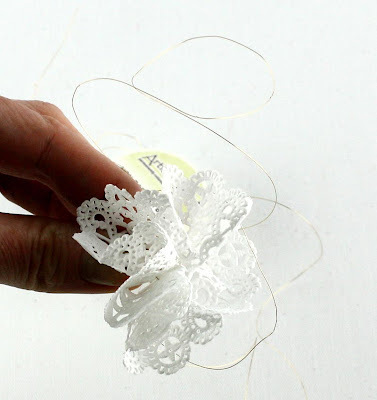 Once you have the holes threaded, grasp both wire tails and gently pull the doily into a flower. Take your time, be gentle and don't mangle it all by rushing! 2. Twist wire tail ends together using chain nose pliers. Cut off excess with wire cutters. Make 11 of these. 3. Use hole punch to punch holes in right and left upper center of each heart. 4. Place hearts on Aleene's Peel and Stick Sheets. Cut around heart, peel off adhesive backing and sandwich the doilies between two hearts. Make sure the hearts are lined up properly so it's easy to link together later! 5. 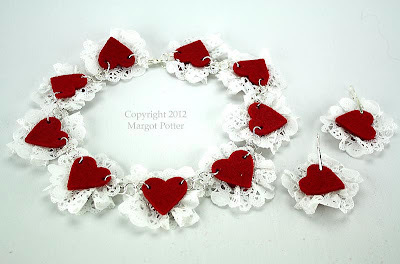 Use 4 10mm jump rings to connect each doily heart. 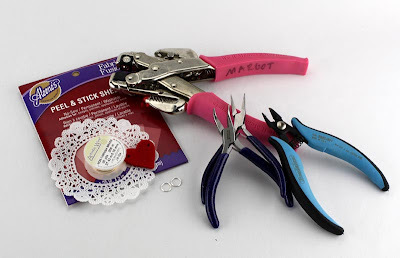 (To learn how to properly attach jump rings with tension, visit my Crafty Quickies on YouTube!) Attach two jump rings on the outside edge of the first and final heart in your chain. Repeat for front and back of design. 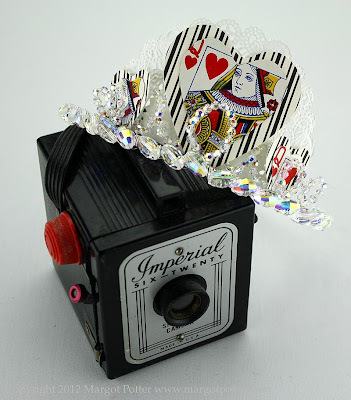 This will prevent the necklace from flip-flopping when worn. 6. Add the clasps to the final jump ring on the first doily heart in each chain. This is how the necklace is connected, having both stabilizes the design when worn. 7. To make earrings, repeat the process of making two doily hearts. but only pierce one hole in each heart so the ear wires can attach. Use pinch bail earrings inserted in the hole of each heart, or you can opt for jump rings and French wires. How simple and cute!! Saving the link for my future classroom!